Personal fishing goals, we all have them. Whether stated publicly or not most of us are always hoping to beat a personal best weight, reel in a rare species, or hook up using an unconventional method, lure, or bait. For some and certainly for me, chasing these goals is what keeps the drive alive. Admittedly though, the dedication needed to reach an angling goal can sometimes get out of hand. It’s the reason I have dozens of fishing poles I probably don’t need, it’s why my tackle box is busting at the seams with the “newest and greatest”, and it’s usually my justification for making those costly boat repairs. Sometimes though, all of the time and money spent can pay off in big ways. 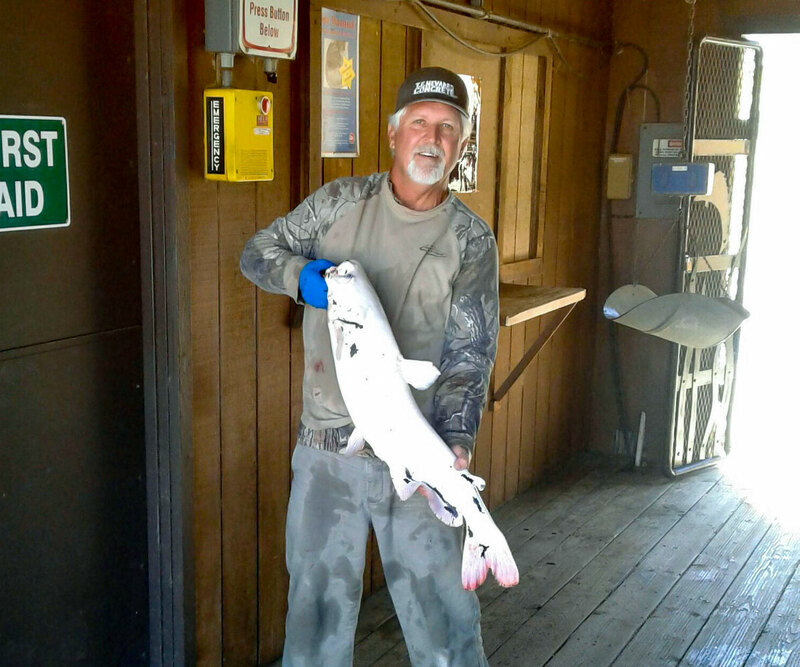 Local angler Bob Baker has for some time only had one goal in his mind, to beat the El Capitan Blue Catfish record. The record which sat at 50.85 lbs has been held by Marrow Kimble since April of 2015. 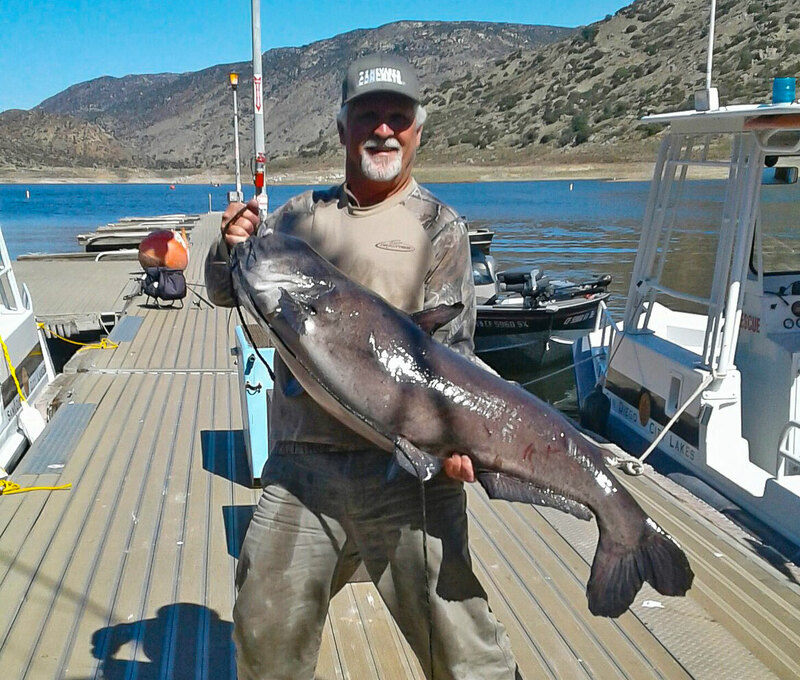 However, two years after setting his goal and an estimated sixty-five trips to El Cap later, Baker succeeded and captured a new record 53.50 pound blue catfish on March 2, 2018. Baker made the catch while anchored in 5 feet of water at high noon in an undisclosed location on the lake using fresh chunks of bonito for bait. After the initial hook up Baker struggled fighting the fish on his 30 lb. test monofilament [fishing line], the fish ran him in circles around his boat four or five times. Fifteen minutes in and just when things were looking up, the fish wrapped around the anchor line. He loosened his drag while attempting to free the line, sacrificing 150 yards of line off the spool in the process. Once the fish was finally free of the anchor line and with his drag reset Baker made quick work of the beast. Five minutes later he had the fish close to the boat when he would have to overcome one more tangle in another line he still had out. Stressed and dire to boat the fish he cut the line on his other pole and reeled the tangled mess through his guides and onto his reel. A risky move, but boy did it pay off! After being weighed and photographed the 53.50 lb. beast was successfully released and swam away from the boat dock with two powerful swoops of its tail. Baker noticed the fish was “clipped” (a technique biologists use to mark fish by clipping a fin and recording data) called former City Lakes biologist Larry Bottroff to inquire. Bottroff estimated the fish to be about 15 years old based on the mark. Baker had another rare catch earlier in the day, a 15 lb. albino catfish. What would usually be a cool picture and story becomes just a side note when records are broken. I asked Baker what he would do now that he has finally reached the goal he has been chasing for years. Although elated to hold the record, he doesn’t think it will last long. He (and certainly others now) will continue chasing the giants of El Cap. El Capitan’s water levels are still dropping with a water temp between 59-61 degrees. Fisherman have reported the bass are in “pre-spawn” mode and are starting to chew well. Bluegill and crappie fishing continues to get better for those that are targeting them. Boat rentals are currently still unavailable, but Rocky Mountain Recreation plans to reopen later this month.